In the second match of the 2015 Major League Soccer campaign, Columbus Crew beat Eastern Conference rival Toronto 2-0 on Saturday night. As for Columbus, Mohammed Saeid made his club debut, replacing Tony Tchani in central midfield. Moreover, Gregg Berhalter fielded Justin Meram instead of Kristinn Steindórsson on the left side. The 41-year-old head coach stuck to the well-known 4-2-3-1 shape, with Federico Higuaín being a very fluid no. 10. Toronto’s starting XI, meanwhile, did not see any changes compared to their 3-1 win over Vancouver a week earlier. Greg Vanney put his men in a 4-3-1-2. Toronto’s winter signing Sebastian Giovinco played a hybrid role once again. The former Juventus player switched between a no. 10 and a higher centre forward position, advancing permanently among Jozy Altidore and Robbie Findley. The last two moved therefore sideways, seeking for holes between the opposing centre-backs and full-backs to make dribbles. Consequently, Giovinco was used as a target runner for long balls rather than as a playmaker on top of the diamond. Therefore, Toronto’s system limited the small Italian, distancing him from the centre midfielders and isolating him in higher spaces. 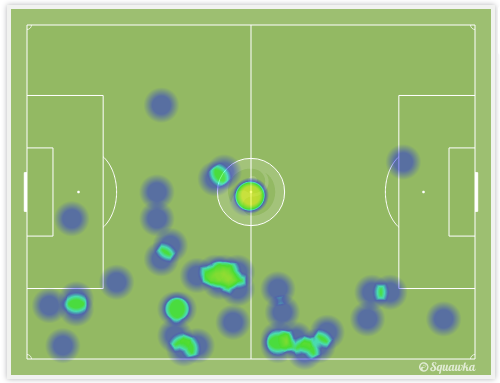 He was slippery on the break, though, what enabled him to have some shots on goal in the early phase of the match. Toronto’s pressing approach was eclectic. The Canadian side sometimes waited with their first block near the halfway line; sometimes Giovinco, Altidore, and Findley pushed forward, attacking the players, who were situationally involved in Columbus’s build-up play. In that particular case, the midfield trio of Bradley, Benoît Cheyrou, and Jonathan Osorio did a good job of pressing early on. They advanced into higher spaces to cover the opposing midfield line man-orientated, while piling the pressure on Columbus’s build-up players. Or alternatively, Toronto pressed in a 4-3-2-1 shape, with Giovinco being used at the front line. Greg Vanney’s idea was simple. Altidore and Findley should block the higher half-spaces or chase the ball-near full-back, while the centre midfielders moved forward carefully to try to hit Columbus on the break, as Giovinco was waiting up-front to make runs behind the back line. However, Toronto left holes, especially behind both full-backs and Cheyrou respectively Osorio, whereby Columbus became dangerous on the break. Particularly Higuaín played a couple of deep through balls right into the path of Kei Kamara who tried to outpace Steven Caldwell and Damien Perquis. Furthermore, Crew SC behaved calmly when it came to how they could out-play Toronto’s first pressing block. 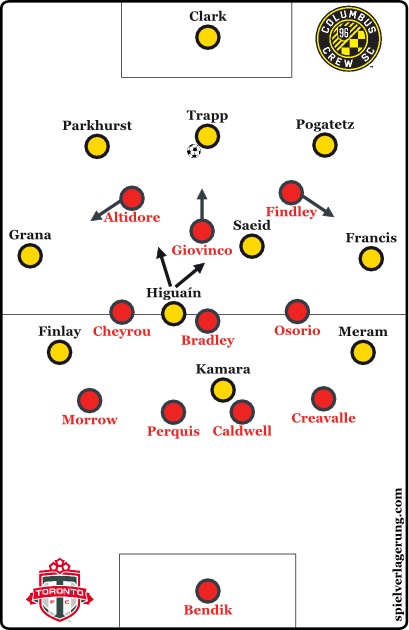 Using a situational back three, with Wil Trapp dropping between both centre-backs, Columbus was able to bypass the first line by using short vertical balls to either Saeid or Higuían. The latter displayed very fluid movements, leaving his no. 10 position and therefore roaming around in the left or right half-space among Saeid. Otherwise, Toronto set up a triangle surrounding Higuaín in the ‘six space.’ So it was necessary that Higuían got rid of Toronto’s clutch which lead up to a 3-4-3 formation in terms of early build-up play. 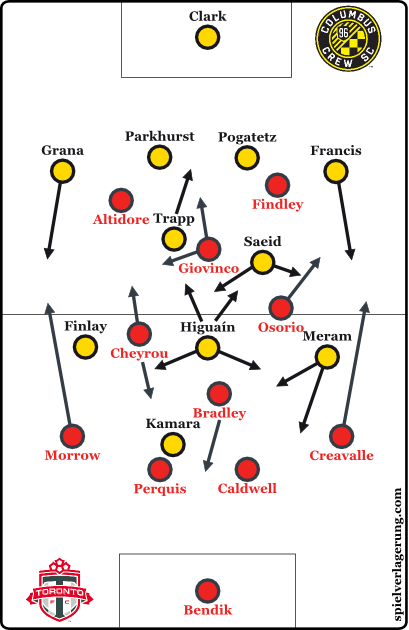 On the other side of the field, Columbus showed a customary 4-4-2 shape defensively. The Ohio side played relatively deep, using a narrow midfield line to lead the opposing build-up play towards the wings, while blocking the centre spaces or creating immediate central pressure. Moreover, Higuían occasionally followed Bradley when Toronto’s playmaker dropped deep between the centre-backs, while Kamara was trying to attack the ball carrier. Vanney asked both full-backs to push high up the pitch in the early stage of their build-up play. 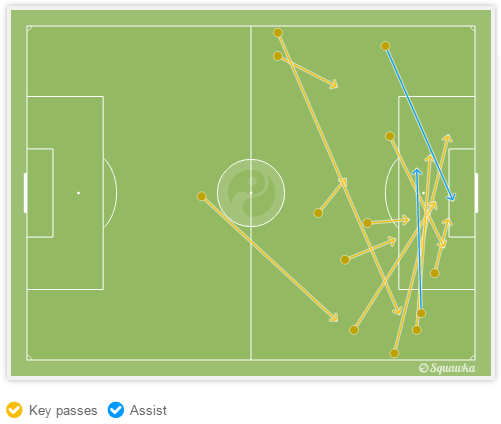 Consequently, Warren Creavalle and Justin Morrow left plenty of space open. Therefore, Columbus had an easy job to use those holes, playing simple 1-2s between a winger and Higuaín on the open side, as both wingers stood very wide in the opposing half. Approaching the half-hour mark, both sides settled into their strategies, with Columbus seeing more of the ball, while Toronto seemed happy to defend stably, and take their chance on the counter. Columbus’ movement off the ball was overall good as this opened up space for others to roam and put pressure on the Toronto defenders, though. At the end of a scoreless first half, the landscape changed dramatically, when left-back Morrow was sent off. Right winger Ethan Finlay benefited from an unnecessary giveaway and sprinted goalwards. Only Morrow was close enough to catch Finlay, and he lunged into a last man tackle from behind. It seemed that he reached the ball, while Finlay went down just outside the Toronto box. Ref David Gantar showed a controversial red, presumably for denying a goal-scoring opportunity. A man down, left-back Ashtone Morgan came in for Osorio – plus Nick Hagglund replaced Caldwell in central defence. Toronto’s head coach changed the formation to a 4-4-1, with Giovinco and Findley playing out wide. Though, the Italian star positioned himself a bit higher, as he waited for long balls on the break. Defensively, Toronto imitated Columbus’ approach, as the midfield line played narrowly and the whole team waited in the own half, when Columbus built up attacks. In the 57th minute, the home team nevertheless scored the 1-0 lead. Finlay once again found space on the right and his perfect cross from the flank found Meram who calmly headed it perfectly past a diving Joe Bendik. Four minutes later, Columbus doubled their total when full-back Waylon Francis floated a perfectly placed ball onto the foot of Kamara who converted with a close rang half-volley. In fact, the match was over. Higuaín remained dangerous from deep, with the Ohio side exploiting the more open spaces in Toronto’s half. For the better part of the second half, Crew SC went without Trapp dropping between the centre-backs, when they built up attacks. Meanwhile, Giovinco and Altidore changed positions on occasion, while Bradley sometimes moved forward in terms of pressing, as the Canadian team played a situational 4-3-2. Eventually, Columbus dominated the match in a one-sided way. Berhalter’s side had 21 total shots with seven on target. The only thing that they really lacked was that clinical finish. 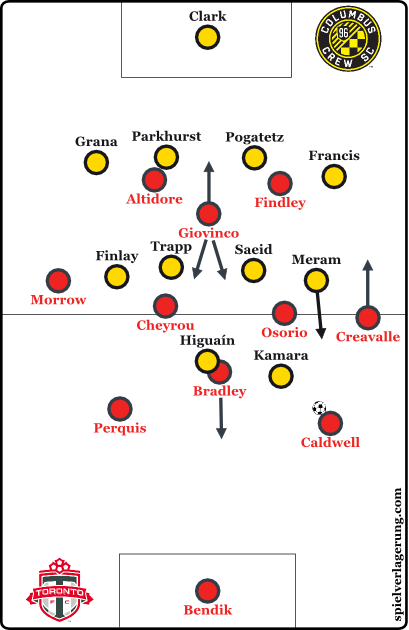 Despite the red card for Morrow just before the half-time whistle, Columbus displayed better pressing and attacking approaches, when both teams had the equal number of men on the pitch. It was therefore a disappointing performance from the affluent Canadians. Vanney has to reconsider the way he uses Giovinco, for instance. On top of this, the likes of Bradley and Cheyrou can offer more than that jejune counter attacking style. I’m pleasantly surprised to see MLS making Spielverlangerung!